How do we know there?s a scientific consensus on climate change? Pundits and the press tell us so. And how do the pundits and the press know? Until recently, they typically pointed to the number 2500 ? that?s the number of scientists associated with the United Nations Intergovernmental Panel on Climate Change. Those 2500, the pundits and the press believed, had endorsed the IPCC position. To their embarrassment, most of the pundits and press discovered that they were mistaken ? those 2500 scientists hadn?t endorsed the IPCC?s conclusions, they had merely reviewed some part or other of the IPCC?s mammoth studies. To add to their embarrassment, many of those reviewers from within the IPCC establishment actually disagreed with the IPCC?s conclusions, sometimes vehemently. The upshot? The punditry looked for and recently found an alternate number to tout ? ?97% of the world?s climate scientists? accept the consensus, articles in the Washington Post and elsewhere have begun to claim. Here?s something you?ll never hear from the Met Office. Joe Bastardi, a senior meteorologist at AccuWeather, has laid into the the global warming lobby for making absurd claims, especially their assertion that the cold weather is caused by global warming. First he told Fox Business Network last week that: ?These folks claiming that global warming is causing severe cold ? that?s like the kid on the playground who doesn?t get his way and takes his ball home?. In fact, the cold weather ?is predictable if you study cycles, if you study climatology? and don?t just say everything is global warming?. Bowman, D.M.J.S., Murphy, B.P. and Banfai, D.S. 2010. Has global environmental change caused monsoon rainforests to expand in the Australian monsoon tropics? Landscape Ecology 25: 1247-1260. Is Global Warming Driving Outbreaks of Tick-Borne Diseases? In a brief review of the roles played by various factors that may influence the spread of tick-borne diseases, Sarah Randolph (2010) of the University of Oxford’s Department of Zoology in the United Kingdom begins by noting that many vector-borne diseases “have shown marked increases in both distribution and incidence during the past few decades, just as human-induced climate change is thought to have exceeded random fluctuations.” And she writes, in this regard, that “this coincidence has led to the general perception that climate change has driven disease emergence,” which concept has been promoted by numerous climate-alarmist publications and pronouncements. However, she wisely notes that “climate change is the inevitable backdrop for all recent events,” most of which no one would ever even dream of attributing to how the planet’s temperature may have behaved concurrently. Chamaille-Jammes, S., Massot, M., Aragon, P. and Clobert, J. 2006. Global warming and positive fitness response in mountain populations of common lizards Lacerta vivipara. Global Change Biology 12: 392-402. A recent re-posting on the SPPI blog from the HockeySchtick site, with the title, ?The 97% ?Consensus? is only 75 Self-Selected Climatologists? was a second look at the claim first made in January 2009, in a paper called ?Examining the Scientific Consensus on Climate Change? by Peter Doran and Kendall Zimmerman, from the department of Earth and Environmental Sciences at the University of Illinois. ?The objective of our study presented here is to assess the scientific consensus on climate change through an unbiased survey of a large and broad group of Earth scientists.? It was roundly de-bunked at the time by several commentators and it would have been forgotten and consigned to its proper place in the dustbin, if it hadn?t been continually quoted by activists as fact. Do We Care if 2010 is the Warmist Year in History? According to the latest from NASA GISS (Goddard Institute for Space Studies), 2010 is shaping up to be ?the warmest of 131 years?, based on global data from January through November. They compare it to 2005 ?2nd warmest of 131 years? and 1998 ?5th warmest of 131 years?. I don?t feel hugely energetic right now in terms of writing anything very complicated. As a simple exercise, I decided to quickly revisit the everchanging Hansen adjustments, a topic commented on acidly by E.M. Smith (Chiefio) in many posts ? also see his interesting comments in the thread at a guest post at Anthony?s, a post which revisited the race between 1934 and 1998 ? an issue first raised at Climate Audit in 2007 in connection with Hansen?s Y2K error. As CA readers recall, Hansen?s Y2K error resulted in a reduction of US temperatures after 2000 relative to earlier values. The change from previous values is shown in red in the graphic below; the figure also shows (black) remarkable re-writing of past history since August 2007 ? 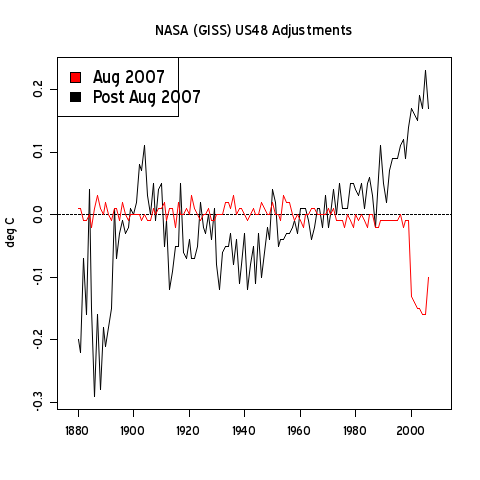 a rewriting of history that has increased the 2000-6 relative to the 1930s by about 0.3 deg C.
This impacts comparisons made in 2007 between GISS and CRN1-2 stations. At the time, it was noted that GISS adjustments for UHI resulted in the GISS US temperature anomaly having quite a bit in common with a TOBS average from Anthony?s CRN1-2 stations. Global Warming hypocrisy on display at UN IPCC COP 16 in Cancun Mexico. We are entreated daily that the West must cut its industrial base because the planet is in danger from our CO2 emissions and our politicians happily fall into line to impose draconian energy taxes. There is somewhat of a disconnect when we read that industrialisation is proceeding apace in developing nations, with money from the industrialised nations. The announcement from Fiat, Italy, is another example of global corporations moving their operations to the developing world where they can emit to their heart’s content without penalty and get paid by us for doing so, with money we give to the UN for “development”. Twenty-two years ago last week, Pan Am Flight 103 exploded over Scotland. The terrorist attack killed 270 people, including 189 Americans and 11 Scots on the ground in the small village of Lockerbie. After a comprehensive international investigation and a lengthy trial held in the Netherlands, three Scottish judges found former Libyan intelligence agent Abdel Basset Ali al-Megrahi guilty of the 270 murders in 2001 and sentenced him to life in prison. He served a mere eight years. You are currently browsing the The SPPI Blog blog archives for December, 2010.